Common Name: Prunella spike, Selfheal spike, Selfheal fruit spike. Spica Prunellae is produced mainly in the provinces of Jiangsu, Zhejiang, Anhui, and Henan. It is collected in summer, and dried in sunlight. Meridians: Liver and gall bladder. Functions: 1. To clear the fire in the liver; 2. To dissipate accumulation of nodules. 1. Flaring up of liver fire manifested as red, painful, swollen and watery eyes, headache and dizziness. Prunella spike (Xiakucao) is used with Sea-ear shell (Shijueming) and Chrysanthemum flower (Juhua). 2. Accumulation of phlegm-fire manifested as scrofula, lipoma, swollen glands or goiter. 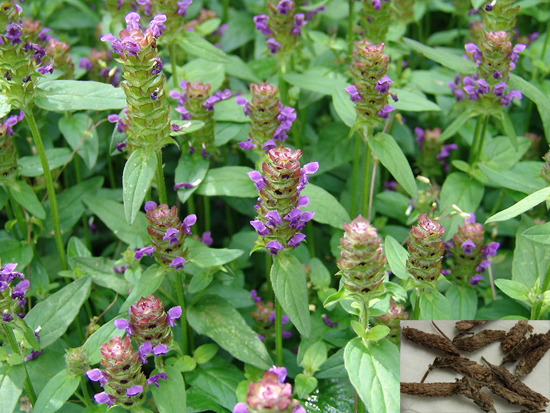 Prunella spike (Xiakucao) is used with Oyster shell (Muli), Scrophularia (Xuanshen) and Laminaria (Kunbu). Cautions & Contraindications: This herb should be used with caution in cases with a weak stomach and spleen.